I have to admit that I'm not a particularly outdoorsy person. I know that it's very important for children to get outside everyday, and I do honestly try my best, but on a grey, cold, winter's day, I'd much rather be tucked up at home with a hot chocolate. Luckily, each of the children enjoy outdoor time in pre-school and at school so I don't feel that I have to worry too much about it! We are fortunate to have a nice garden with a big vegetable patch and a lovely summerhouse that we inherited when we moved in. I had big plans for our summerhouse, and although it has taken a while to get things going I'm determined that this will be the year that I really make something of it. My Dad replaced the roof last year, so it's a nice, dry outside room. I never tidied it up properly at the end of last summer, so it has spent the winter as a tip, with discarded garden toys chucked in and ignored. Over the last week or two I've had a massive clear out, with one bin bag of rubbish gone and one bin bag of extra toys given away on Freecycle. I've also given away a rickety chest of drawers, replaced some old children's garden furniture with our newer set from Harry's bedroom, and gone around with the hoover getting rid of cobwebs and dead woodlice. Now I'm focusing on making it a bit more homely and more of a play space. I was recently gifted a sewing machine which I was thrilled about, and I'm planning to make some proper little curtains for the windows and some bunting to string outside. I might even manage a cushion! I've also been scouring Twinkl for fun and educational signs and posters to laminate and stick up inside - these are the Animal Groups Display Posters (Twinkl subscriber resource). I have a beautiful butterfly light fitting that was rescued from Mia's room in the old house, but unfortunately the light part broke when we took it down. I've finally upcycled it into a mobile and I think it looks lovely along with my denim and felt butterfly bunting that I made a few years ago now. I'm going to move some of our older toys out there in the hope that they will get played with again in a different environment, like our car garage, a box of cars, and some of the Happyland bits. It won't be long before I'll be setting up our big outdoor sandpit, which is still in pretty good condition despite being a few years old now. We've also put the swings out, and it looks as though Mia will move on from her baby swing this year onto a proper adult swing. Now I just need to hope that we have a nice warm summer again for plenty of outdoor play! Familiarity with technology is very important these days, and with the new school curriculum involving the teaching of coding to children as early as Key Stage 1 (5-7 year olds) Harry is the perfect age to begin his computing education. Ram is continuously upgrading our home computers, and a few weekends ago Harry was watching with interest while he built a new home server. So when we were offered the chance to review a Kano kit he was delighted. 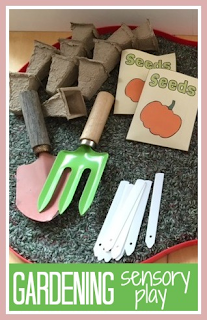 It was the opportunity to work on something similar together that was especially designed to appeal to and be appropriate for young children Harry's age. Kano Computer Kit (affiliate link) is a computer that you build yourself. The kit contains everything that you need to build a fully functional computer that can be completely customised, and allows children to develop their coding and programming skills at a level that suits them. The Kano comes in a really sturdy well designed box - more akin to a luxury gift item. Inside the box - a Raspberry Pi Model B chip (the original Raspberry Pi, not the newer faster one released over the last 6 months), instruction books for the basic build and coding, a speaker, a wireless keyboard which is also Bluetooth enabled, the Kano operating system, an SD Card, a case with stickers to customise it, HDMI cable, Charger + USB charging cable and a WiFi dongle. You just need to supply a screen with HDMI input. Harry is only just 6, but he's very good at following instructions for construction kits like Lego, and we found that the instruction booklet was very clear and geared to children that age. What I really liked about the instructions is that they don't just focus on how to connect certain pieces together, it explains what they are and their purpose. This is good because the key purpose of this kit is not just to be able to put it together but also to learn how it works. Building the Raspberry Pi within its case and connecting the speaker to it was not tricky for him. The Raspberry Pi is not like a PC - it's a chip which effectively has its on-board memory, the CPU, already on the motherboard, so it's simply a case of putting it into a study case and locking it. Attaching the speaker was a little more tricky as you have to connect the power for the speakers to the motherboard with some small pins that need to go in the right order in the correct place. Once this is done, you simply insert a standard SD card which contains the operating software, exactly like you would in a phone. The Raspberry Pi is connected to a screen via the HDMI lead. To start with we have the Kano connected up to the television in our living room, but in the longer term we are going to use it with a PC monitor as that will be easier to operate. The Kano comes with a handy WiFi dongle to connect it to the Internet, as well as an Ethernet port. As we had a internet Ethernet socket nearby we used that instead. The wireless keyboard comes with a USB WiFi adaptor, which plugs into the device so that you can use your keyboard nearby. I like the fact the keyboard doesn't need batteries and can be charged via a connected USB lead. I also like that it is Bluetooth enabled - this means it's also possible to use it with modern day TVs, iPads, phones and so on, which is a great added benefit. Finally you can connect the power cable to the device, and turn it on. It takes a while to get to the actual interface. First you go through some boot-up and pages to connect to the Internet and learn how to use the keyboard. After this it connects to the Internet and updates the software - which did take 15-20 minutes to do. Once you get into the interface, first impressions are that it has some good basic games, access to YouTube, as well as the ability to install apps such as XBMC. However navigating around the interface and loading up items can be a little slow - which is to be expected as the Raspbery Pi is not a high powered PC. We've not had the chance yet to explore all the further features that the Kano can offer, so I'll be writing an updated post when Harry has had the chance to really get his teeth into it and look at the second book that came with it around coding. We received the Kano kit in exchange for a review. Amazon links are affiliate. I've been eyeing up Easter trees for a couple of years now. Something that I've only come across recently (with Pinterest to blame once again! 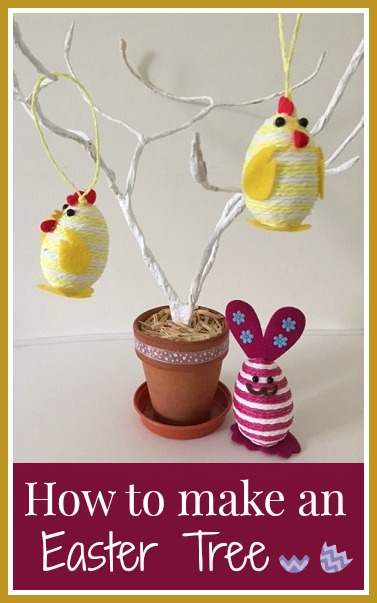 ), Easter trees are a way of displaying hanging Easter decorations, and usually take the form of a painted white branch, or wires formed into the shape of a simple tree. This year I almost considered poppping down to Hobbycraft and purchasing one, but when I discovered that prices started at £20 I thought that there had to be a way that I could make one myself. 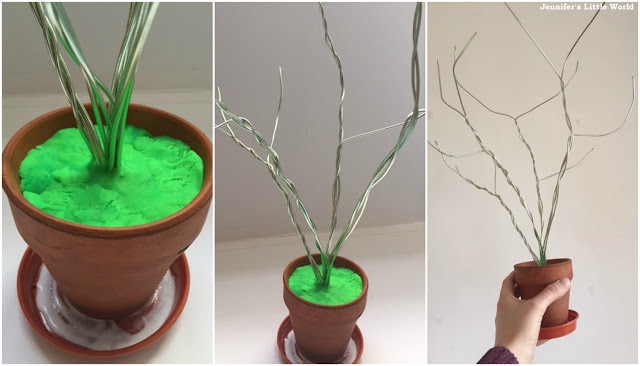 The obvious Easter Tree DIY is to just find a suitable branch and paint it white, but I feel a bit uncomfortable at the idea of wandering around in woodland armed with a saw, so I decided to use some thick wire that I had on hand to fashion my own tree branches. Cut about twelve lengths of wire, I cut four each of three slightly different lengths. My longest length was about five times the height of the flower pot. Tape all the lengths together firmly at the bottom. Fill the flowerpot up with old play dough or florist foam and push the taped together end of the wire bundle in firmly. I discovered that it's a good idea to use a neutral coloured play dough if you can! 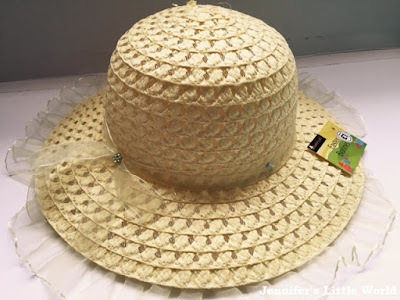 Glue the flowerpot into the saucer with plenty of glue. Then shape the branches of your tree. You might need to play around with the design for a while until you achieve something that you are happy with. My tree has three main branches coming up from the centre, and I've twisted the wires around to make shorter and longer branches which hang at different heights. 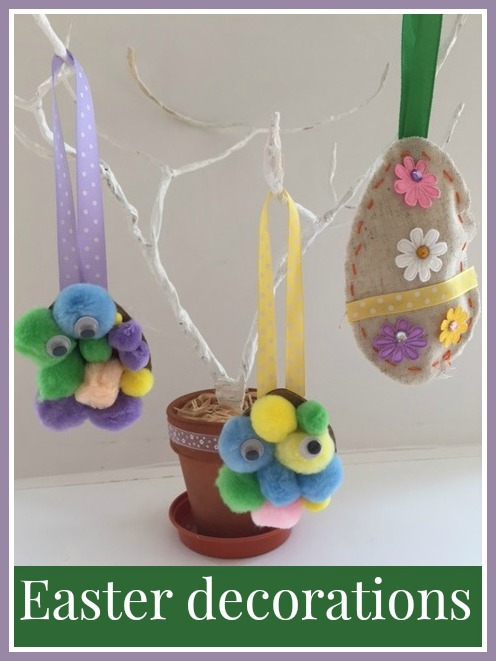 I've also made the Easter tree with the plan of hanging small ornaments in mind, so the branches are looped with shallow hooks to hang things from. 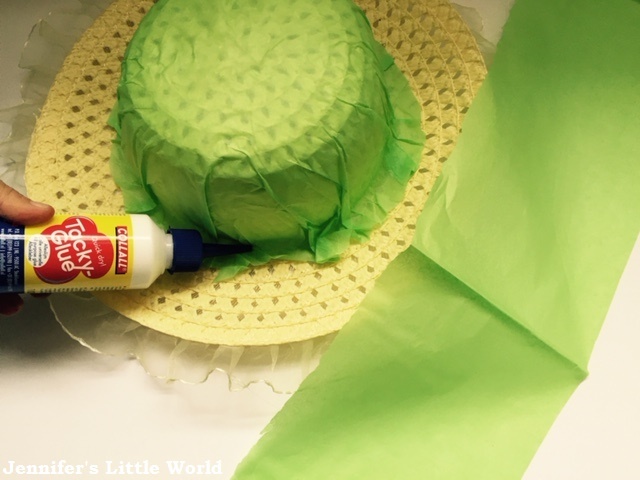 Then cover the wire branches with tissue paper. I cut long strips of tissue paper, covered them in white PVA glue, and wrapped them around the wires, making sure to completely cover the sharp ends at the top of the branches. When the tree was all covered I added an extra layer of glue and also some glue on top of the play dough, just to make sure that it all held in place. Then paint the tree white. I used white gloss paint and it needed two coats. Make sure to cover your work surface while painting and drying to protect from drips, and keep an eye on the tree as it dries to make sure that there aren't any drips hanging down from the branches. When it was all dry I decorated the flower pot. I put plenty of glue into the top of the flowerpot and filled it up with cut up pieces of raffia. Then I found some pretty ribbon to glue around the rim. I tried to keep it neutral so that it doesn't detract from the decorations, and I can use it with different colour schemes. I was so pleased that I was able to make this tree entirely with materials that I already had on hand, and I'm really proud of it! 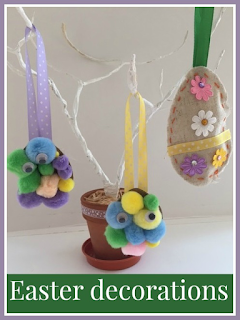 The decorations currently on the tree were ones that I received as part of an Easter crafting project from The Works, and I have plenty of ideas for making our own decorations now that we have somewhere nice to display them. If you don't want your Easter Tree to sit in a cupboard for the rest of the year, you can easily re-theme it. I turned ours into a Halloween Tree, and you could also use it at Christmas, perhaps as an Advent calendar with hanging pockets. As I mentioned earlier in the week, as a part of my recent decluttering I've been sorting through some old photos. I keep them all in boxes, and it seemed a shame when they made me so happy to look through them, so I thought that I'd make some frames so that I can keep a few favourites on display. Of course it had to be Hama beads! 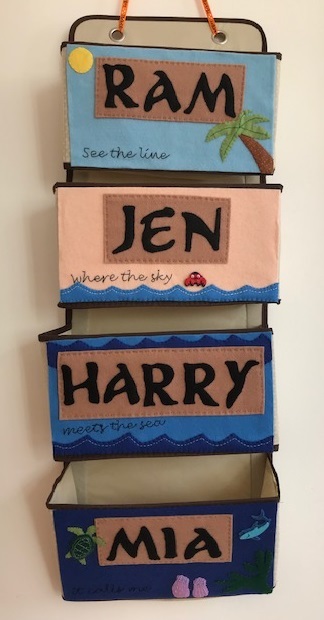 To make a frame large enough to display a standard photo I found that it was best to use two large square pegboards, which are designed to slot together so that you can make a design across both boards. You could use a single square board but you'd only be able to display smaller photographs. For more complicated designs I map them out on graph paper beforehand. Be warned, these frames use up a lot of Hama beads! Assemble the frame on the boards as usual and iron. After ironing, it's important to place the frame underneath something heavy for a few minutes while it cools, to prevent it from warping. I always iron the design more on the side that will be at the back to keep it sturdy, as I like the look of the beads when they aren't ironed too much. I made a back for the frames using thin cardboard which I taped to the back of the frame at the top and bottom, leaving the sides open to insert the photograph. I used white cardboard, in case I want to frame a photograph that isn't large enough to fill the frame. I've been propping them up on the mantlepiece, but they are light enough to stick easily to a wall, or you could make a flap from a second piece of cardboard so that they can stand up. Hama beads are available in a huge range of colours so you can pick out those that match your decor, they don't need to be garish, there are some lovely subtle shades available. This frame is displaying my current favourite picture that I found while sorting out, my sister and I bathing dollies in the garden. I showed the photo to Mia and she wouldn't stop going on about it until I let her take her dolly in the bath with her that night! This is the template for the design. You can see this in my Transport post. This photograph was taken on the top of a bus, so it's the perfect subject matter for a road themed frame! Harry has his eye on this one. The basic Cars Hama bead frame is just made to look like a simple road, then it incorporates some little cars that are glued onto the bottom of the frame to make them stand out. It's hard to show in a photo, but it looks pretty cool! I just used white PVA glue to stick the small designs to the frame. This is the template for the design - super simple! This is a really simple frame, made more interesting with a striped heart in the corner. For the heart I used a basic cross stitch heart design which I found here. Some of the beads in this frame are my stripy Perler beads which I bought on holiday in the US. Perler beads are almost identical to Hama beads, the only difference I've found is that they seem harder somehow, but they are fine to mix with branded Hama beads. I'm not sure where you can easily buy them from in the UK, I'll definitely be keeping my eyes open because I do love the stripy beads. I completed the frame with one of my old baby photos! Here is the design for the frame. You could add another heart on the opposite side or corner, and use all sorts of different colours. I hope that you liked my Hama bead frame ideas! I've also made Hama bead frames previously. You might like my Hama bead frames inspired by Roman mosaic designs or my Hama bead heart frames. For all my Hama bead designs visit my Hama bead page.